As previously discussed snapper aren't overly fussy feeders and will take a wide variety of baits. They can however get a little one eyed at times, such as when small squid, hardiheads and pilchards school up or when tuna and mackerel are slicing through bait schools. At such times feeding them down those or at least similar baits will see you outfish others 10 to 1. By the above you might be thinking that snapper like an easy feed and you would be right. These guys are suckers for a good burley trail with baits in those trails being scoffed down like a kid with lollies. Just keep in mind we don't want to feed them we just want to get their interest and make the most tempting morsel our bait. Over using burley can not only work against you by filling the snappers bellies but also attracting sharks which might decide the snapper you have on your line would be better off in their belly. Unhooking snapper heads from your line is never a cause for celebration, so keep that in mind if you start to feel impatient during a quiet period. Although not particularly fussy one thing that will put most snapper off of pouncing your bait is if it is spinning. Poor bait presentation is the reason a bait that has been sitting untouched for 20 minutes can be smashed on the drop when replaced. The old spinning bait has now been removed the new bait moves in the water more naturally therefore not causing the fish to be less alert. This goes for almost any species not just snapper. The better you can present a bait or lure so that it seems like something a fish would normally see and eat then the more bites and fish you will catch. In the shallows where lesser quality fish are likely to be encountered smaller softer baits such as pilchard on gangs or small whole squid on single hooks are a good option. If there is limited current no weight presents an irresistible wafting temptation that few snapper can resist. Cut baits of mullet, tailor or salmon will also be effective, as will minimally weighted smaller live baits such as herring or hardiheads. In deeper bay areas that are known for catching big snapper larger baits come into their own. 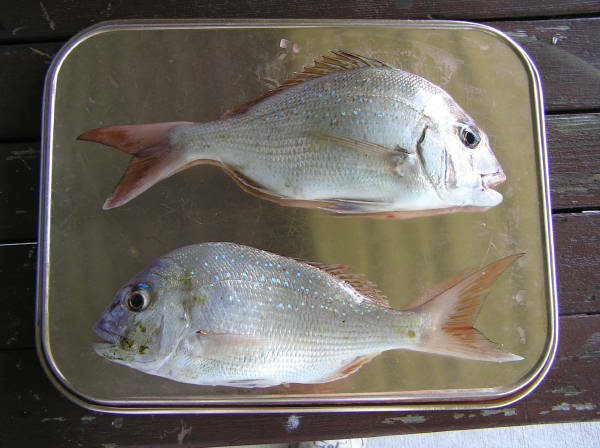 Choices such as tailor and mullet fillets, whole whiting or heads, whole and half pike, in fact any large bait will certainly attract the attention of large snapper. Presentations can be improved by butterflying fish removing the backbone for more natural "swimming" movement but I'm unconvinced this will dramatically improve results. In fact at times these presentation seem to make baits more appealing to smaller fish and only result in many more bait changes being necessary. These deeper areas will more often than not have reasonably strong current and weight will be needed to get the baits "near" the bottom. I put near in quotes as near the bottom will have you catching much less by catch in the way of giant rays, wobbygong sharks and other unwanted species. With a lot more water in between large snapper than small ones, use of a rod holder is a good option. But be prepared because when the bite comes it is probably going to be a good one. I prefer to fish the reel in the holder with fighting drag (mono) on as I don't subscribe to the idea of hiding hooks or allowing the fish time to swallow the bait. Sharp well placed hooks will penetrate the mouths of anything that picks them up so why give them a chance to change their mind. In offshore areas float baiting can come into its own. Moderately weighted large baits drifted down in a burley trail can be deadly on a lot of species but snapper simply can't resist this style. The old paternoster rig still has its place if deep bait and stalking larger fish are showing on the sounder. One of the biggest changes in snapper fishing in recent years has been the explosion in targeting them with soft plastics. These artificial baits in varying sizes and colours have proved very effective when presented on the drift. Sizes from 3 to 7 inches have proved most effective as they best represent profiles of the bait fish most likely to be encountered in most areas. One of the advantages of fishing for snapper with soft plastics is this style works most effectively during the daylight hours. Slow sinking hard bodies are also effective however given the ground you are fishing the losses of these types of lures will have your wallet hemorrhaging. Saltwater flies of a kind have also been reinvented with snapper snatchers and other such flasher flies gaining popularity. Tipped with a slice of squid or cut flesh these can be effective in attracting attention to baits which might otherwise be bypassed. Whatever your style try not to become set in your ways, have a number of different baits out when chasing snapper. Adjust weights to speed up or slow your offerings drop toward the bottom. Be prepared for big snapper to hit when you are doing something else, they are masters at this. And lastly try not to follow the crowd, seek out quieter areas. Often what may be a lesser area will prove more productive because the fish are less timid away from the maddening horde.